Draft: 2004, Colorado Rockies, 31st rd. Xavier signed a one-year non-guaranteed contract with the Cubs February 14 of this season ... holds a career 10-7 record with 57 holds, three saves and a 3.69 ERA (72 ER/175.2 IP) in 249 relief appearances covering all or part of eight major league seasons with Houston (2011-13), Washington (2013-15), Tampa Bay (2015-17), the White Sox (2018) and Milwaukee (2018) ... Has averaged nearly a strikeout per inning in his major league career, fanning 174 batters in 175.2 innings ... Has gone 42-41 with nine saves and a 4.07 ERA (332 ER/734.2 IP) in 276 minor league outings ... Pitched for Team Puerto Rico during the 2013 World Baseball Classic … allowed one earned run in 4.1 IP over seven relief appearances, including a save on March 8 vs. Spain ... Was originally selected by the Colorado Rockies in the 31st round of the 2004 Draft ... Attended Escuela Asunción Rodriguez de Sala in Puerto Rico … also attended Miami-Dade Community College. Xavier combined to go 2-0 with one save, 11 holds and a 2.43 ERA (9 ER/33.1 IP) in 48 relief appearances between the Chicago White Sox and Milwaukee Brewers ... Was acquired by the Brewers on August 31 and allowed only one run in 8.0 IP (1.13 ERA) covering 15 outings ... Allowed just one homer in 33.1 innings ... limited opponents to a .210 average, including a .207 mark by lefties ... Made his postseason debut, appearing in four NLCS games with Milwaukee (2 ER/1.0 IP). Was limited to nine appearances with Tampa Bay due to a left forearm strain … was placed on the disabled list on 4/18 and transferred to the 60-day disabled list on 5/18 … missed the remainder of the season.Was sent on a rehab assignment to Class AA Montgomery from 9/9-21 but did not pitch … was reinstated from the 60-day disabled list on 9/21. Made 54 apps, but none after Aug 29 at BOS as he was sidelined by neck stiffness…prior to the injury he led Rays relievers in apps. Has made 115 apps in less than two seasons with the Rays…from April 28, 2015-the date of his Rays debut-through his final game of 2016, only one AL lefty made more apps: NYY/DET Justin Wilson (119). Limited left-handed batters to a .197 avg. (15-for-76) with only 2 XBH-both doubles on April 21 vs. BOS (David Ortiz, Travis Shaw)…after that, faced 80 lefty batters without yield-ing an extra-base hit through the end of the season. Had a stretch of 18 apps from July 19-Aug 8 where he pitched to a 7.50 ERA (12-IP, 10-ER)…otherwise had a 2.15 ERA (29.1-IP, 7-ER). Was charged with a team-high 5 blown saves, the last coming on Aug 2 vs. KC, when he yielded a go-ahead, 2-run homer to Salvador Pérez. Finished his season with 8 consecutive scoreless apps, beginning Aug 16 vs. SD. Despite not joining the Rays until their 21st game of the season, he finished 4th on the staff (and first among lefties) with 61 appearances...he also led the staff in appearances from the time he joined the Rays through the rest of the season...during that span, only three AL lefties appeared in more games: DET Blaine Hardy (65), NYY Justin Wilson (65) and CWS Zach Duke (62)…Was designated for assignment by both the Nationals and Dodgers in April before the Rays acquired him from the Dodgers for cash considerations on April 27…As a Ray, allowed only 4 of 30 inherited runners to score (13.3 pct. ), tied with OAK Fernando Rodriguez for best ratio in the AL and 3rd best in club history behind Jake McGee (3 of 30 in 2014) and J.P. Howell (4 of 35 in 2008)...his 20 holds were 3rd among AL lefty relievers…His 2.09 ERA ranked 3rd all-time by a Rays left-handed reliever (min. 50 apps) behind Jake McGee (1.89 in 2014, 1.95 in 2012)...lefties batted .196 off him...opponents hit only .118 (2-for-17) with RISP and 2 out…Of his 61 appearances with the Rays, 36 were less than an inning and 13 were just one batter faced...averaged 11.1 pitches per outing, fewest among AL relievers (min. 50 apps)...it was the 3rd-lowest mark among relievers in club history behind Randy Choate (8.3 in 2010) and Trever Miller (10.5 in 2008)…His first 12 apps with the Rays were scoreless, one shy of Joaquin Benoit's club record (2010) to begin a Rays career…Earned his first career win on June 20 at CLE, in his 102nd career appearance...according to the Elias Sports Bureau, it was the most apps before a win since TEX Brian Shouse in 2004 (112th app)….Credited with a 3-2 victory Aug 30 vs. KC, the Rays only win of the season over the eventual World Champions…In August, earned a hold and win vs. NYM and a save vs. ATL during the Rays 4-game win streak that brought them to 1.5 games out of the AL Wild Card race…For one month (July 19-Aug 19) had a club-record streak of 15 apps without a run or walk. Opened the season with Triple-A Syracuse before making his first of four trips to Washington in mid-April...Posted Minor League career bests in strikeouts per nine innings (13.0), batting average against (.163) and WHIP (0.86)...In the second half of the Triple-A season, posted a 1.59 ERA (3 ER/17.0 IP) while striking out 26 against just three walks in 15 games...Was called up for good when rosters expanded on Sept. 1...With the bases loaded, one out and the game tied at 3-3, struck out LAD's Adrian Gonzalez in the bottom of the 10th inning of a 14-inning marathon 8-5 victory over the Dodgers on Sept. 3. Began '13 with the Astros, was claimed off waivers by Washington on April 23 and ultimately enjoyed 5 stints with the Nationals...capped the 2013 campaign with 4.1 scoreless innings spanning 8 appearances from Sept. 11-29...pitched in 39 games and went 2-0 with 3 holds, 4 saves and a 1.39 ERA for Syracuse of the Triple-A International League...in 19 appearances for Santurce of the Puerto Rican Winter League, pocketed 4 saves and a 2.49 ERA (struck out 36 in 21.2 innings)...was member of Puerto Rico's World Baseball Classic entry...in 4.1 relief innings spanning 7 appearances, posted one save (March 8 vs. Spain) and a 2.08 ERA. Rookie southpaw appeared in 44 games during two stints with Houston...ranked tied for sixth in theNL in appearances among rookie relievers...did not allow a run in 22 of his 23 games at Minute Maid Parkin 2012...allowed seven hits in 13.0 innings, while posting one save and a .156 (7x45) opponent's battingaverage at the venue...held left-handed hitters to a .213 (13x61) batting average... began the season in thebullpen at Triple A OKC before getting his contract purchased on May 27...optioned on June 29...recalledon July 25 and finished the season with the Astros...tossed a career-high 3.0 innings on June 13 at SF...picked up his first ML save on June 18 vs. KC...ended the game by recording a bases-loaded popout by MikeMoustakas (was his only batter faced)... went 2-0 with a 2.28 ERA (7ER/27.2IP) in 22 relief appearances atTriple A Oklahoma City...was OKC's Pitcher of the Month for May, where he posted a 0.63 ERA (1ER/14.1IP)and 14 strikeouts in 11 relief appearances...pitched in three games for Cangrejeros de Santurce in the PuertoRican Winter League...posted a 1-0 record with eight strikeouts and no runs allowed in 3.2 innings...gave upjust two base hits. Appeared in only three games for Houston as a September call-up, the first three games of his MLB career...began the year at Double A Corpus Christi and finished the minor league season at Triple A Oklahoma City...had his contract purchased by Houston on Sept. 11 and made his MLB debut on Sept. 16 at CHC (0ER/0.1IP)...is one of 11 Astros players, seven pitchers, to make their MLB debut this season...had two scoreless appearances of 0.1 of an inning to begin his career before allowing five runs in 1.0 inning on Sept. 25 vs. COL...went 7-9 with a 4.38 ERA (67ER/137.2IP) in 35 combined games, 22 starts, between Triple A and Double A Corpus Christi this season...he was a Texas League All-Star and finished tied for seventh in the TL in strikeouts(110)...was named TL Pitcher of the Month for June...on June 22 vs. Frisco, fanned the first nine batters he faced en route to a record-setting, 14-strikeout performance...the 14 K's were the most in Hooks franchise history...he had a perfect game through 5.2 innings before allowing a single and ended up allowing just one hit in 6.2 shutout innings, but had no decision...outrighted off the club's 40-man roster on Oct. 5...pitched for Carolina in the Puerto Rican Winter League following the season and went 2-2 with two saves and a 1.77 ERA (4ER/20.1IP) in 13 reiief appearances. Entered the season in Colorado's organization before being released following Spring Training...did not play during the regular season...pitched for Carolina in the Puerto Rican Winter League and went 1-2 with a 2.32 ERA (11ER/42.2IP) in 12 games (seven starts)...signed by Houston to a minor league contract on Dec. 22. After spending his first four professional seasons as a starter, worked exclusively out of the bullpen while splitting time between Double A Tulsa and Class A Modesto...combined to go 4-4 with a 4.66 ERA (33ER/63.2IP) in 44 games. Made 19 starts while spending his entire season with Tulsa...his 4.12 ERA (102.2IP/47ER) was the lowest of the six Drillers to make 16 starts or more...made just one start in August (8/31) because of a DL stint from July 23-Aug. 30. Made 23 starts for Modesto going 6-8 with a 5.09ERA (66ER/116.2IP)...was Colorado Rockies' organizational Pitcher-of-the-Month for July after going 4-0 in five starts with a 2.90 ERA (10ER/31IP), with 23 strikeouts. Of his 27 starts, 13 were quality outings...allowed two runs or less in 15 of 27 games and three runs or less in 21 contests...struck out a season-high eight batters on April 30 at Columbus. Spent first pro season with Casper...earned first professional win on Aug. 21 vs. Helena (1ER/6.2IP). April 18, 2019 Chicago Cubs sent LHP Xavier Cedeno on a rehab assignment to Tennessee Smokies. March 28, 2019 Chicago Cubs placed LHP Xavier Cedeno on the 10-day injured list retroactive to March 25, 2019. Left wrist inflammation. 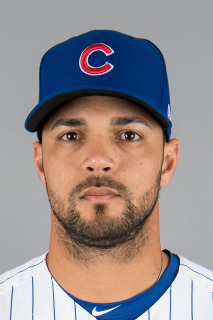 February 14, 2019 Chicago Cubs signed free agent LHP Xavier Cedeno. November 30, 2018 LHP Xavier Cedeno elected free agency. September 1, 2018 Milwaukee Brewers activated LHP Xavier Cedeno. August 31, 2018 Chicago White Sox traded LHP Xavier Cedeno to Milwaukee Brewers for LF Bryan Connell and RHP Johan Dominguez. June 7, 2018 Chicago White Sox selected the contract of LHP Xavier Cedeno from Charlotte Knights. February 8, 2018 Chicago White Sox signed free agent LHP Xavier Cedeno to a minor league contract and invited him to spring training. February 8, 2018 LHP Xavier Cedeno assigned to Charlotte Knights. December 1, 2017 LHP Xavier Cedeno elected free agency. September 21, 2017 Tampa Bay Rays activated LHP Xavier Cedeno from the 60-day disabled list. September 13, 2017 Tampa Bay Rays sent LHP Xavier Cedeno on a rehab assignment to Durham Bulls. September 13, 2017 sent LHP Xavier Cedeno on a rehab assignment to Durham Bulls. September 9, 2017 Tampa Bay Rays sent LHP Xavier Cedeno on a rehab assignment to Montgomery Biscuits. May 18, 2017 Tampa Bay Rays transferred LHP Xavier Cedeno from the 10-day disabled list to the 60-day disabled list. Left forearm tightness. April 21, 2017 Tampa Bay Rays placed LHP Xavier Cedeno on the 10-day disabled list retroactive to April 18, 2017. Left forearm tightness. April 28, 2015 Tampa Bay Rays activated LHP Xavier Cedeno. April 27, 2015 Los Angeles Dodgers traded LHP Xavier Cedeno to Tampa Bay Rays for cash. April 24, 2015 Los Angeles Dodgers designated LHP Xavier Cedeno for assignment. April 22, 2015 Washington Nationals traded LHP Xavier Cedeno to Los Angeles Dodgers for cash. April 14, 2015 Washington Nationals designated LHP Xavier Cedeno for assignment. October 30, 2014 LHP Xavier Cedeno assigned to Cangrejeros de Santurce. October 30, 2014 Cangrejeros de Santurce placed LHP Xavier Cedeno on the reserve list. October 13, 2014 Washington Nationals activated LHP Xavier Cedeno. October 3, 2014 Washington Nationals reassigned LHP Xavier Cedeno to the minor leagues. September 1, 2014 Washington Nationals recalled LHP Xavier Cedeno from Syracuse Chiefs. June 30, 2014 Washington Nationals optioned LHP Xavier Cedeno to Syracuse Chiefs. June 28, 2014 Washington Nationals recalled Xavier Cedeno from Syracuse Chiefs. June 18, 2014 Washington Nationals optioned LHP Xavier Cedeno to Syracuse Chiefs. June 13, 2014 Washington Nationals recalled Xavier Cedeno from Syracuse Chiefs. May 25, 2014 Syracuse Chiefs activated LHP Xavier Cedeno from the 7-day disabled list. May 2, 2014 Syracuse Chiefs placed LHP Xavier Cedeno on the 7-day disabled list. April 22, 2014 Washington Nationals optioned LHP Xavier Cedeno to Syracuse Chiefs. April 18, 2014 Washington Nationals recalled Xavier Cedeno from Syracuse Chiefs. March 25, 2014 Washington Nationals optioned LHP Xavier Cedeno to Syracuse Chiefs. September 3, 2013 Washington Nationals recalled LHP Xavier Cedeno from Syracuse Chiefs. August 27, 2013 Washington Nationals optioned Xavier Cedeno to Syracuse Chiefs. August 23, 2013 Washington Nationals recalled Xavier Cedeno from Syracuse Chiefs. August 6, 2013 Washington Nationals optioned Xavier Cedeno to Syracuse Chiefs. August 4, 2013 Washington Nationals recalled Xavier Cedeno from Syracuse Chiefs. June 16, 2013 Washington Nationals optioned Xavier Cedeno to Syracuse Chiefs. June 6, 2013 Washington Nationals recalled Xavier Cedeno from Syracuse Chiefs. May 28, 2013 Washington Nationals optioned Xavier Cedeno to Syracuse Chiefs. May 27, 2013 Washington Nationals recalled Xavier Cedeno from Syracuse Chiefs. April 23, 2013 Washington Nationals claimed LHP Xavier Cedeno off waivers from Houston Astros. April 23, 2013 Washington Nationals optioned Xavier Cedeno to Syracuse Chiefs. April 18, 2013 Houston Astros designated Xavier Cedeno for assignment. July 25, 2012 Houston Astros recalled LHP Xavier Cedeno from Oklahoma City RedHawks. June 29, 2012 Houston Astros optioned Xavier Cedeno to Oklahoma City RedHawks. May 27, 2012 Houston Astros selected the contract of Xavier Cedeno from Oklahoma City RedHawks. April 14, 2012 Xavier Cedeno roster status changed by Oklahoma City RedHawks. April 5, 2012 Oklahoma City RedHawks placed LHP Xavier Cedeno on the 7-day disabled list. November 15, 2011 Houston Astros invited non-roster LHP Xavier Cedeno to spring training. November 4, 2011 LHP Xavier Cedeno assigned to Gigantes de Carolina. October 5, 2011 Houston Astros sent LHP Xavier Cedeno outright to Oklahoma City RedHawks. September 11, 2011 Houston Astros selected the contract of Xavier Cedeno from Oklahoma City RedHawks. August 1, 2011 Xavier Cedeno assigned to Oklahoma City RedHawks from Corpus Christi Hooks. July 23, 2011 Xavier Cedeno assigned to Corpus Christi Hooks from Oklahoma City RedHawks. July 20, 2011 Xavier Cedeno assigned to Oklahoma City RedHawks from Corpus Christi Hooks. January 19, 2011 LHP Xavier Cedeno assigned to Toros del Este. December 22, 2010 Corpus Christi Hooks signed free agent Xavier Cedeno. April 2, 2010 Modesto Nuts released LHP Xavier Cedeno. December 13, 2009 LHP Xavier Cedeno assigned to Gigantes de Carolina. August 15, 2009 Modesto Nuts activated LHP Xavier Cedeno from the 7-day disabled list. August 6, 2009 Modesto Nuts placed LHP Xavier Cedeno on the 7-day disabled list. July 13, 2009 LHP Xavier Cedeno assigned to Modesto Nuts from Tulsa Drillers.